Forces’ schools in Singapore were modelled on the education system in the UK with Primary schools from age 5 to age 11 and Secondary schools from age 11 to age 15, 16 or 18 depending on the level of dedication and attainment. The Secondary system was split into two, the more academic would go to the “Grammar” school whilst the less academic would be given an education that was focused more towards practical skills but with a degree of academic requirement as well. These were known as the “Modern” schools. Which type of school you attended was determined at the age of 11 by the 11 plus examination. This included tests on mathematical ability, comprehension and IQ testing of the type where you had had to identify the next number in various sequences, sometimes arithmetic sometimes geometric in progression. Reasoning tests were also there with strange items to solve like the odd one out in a series of pictures say like a square, a rectangle, a triangle and a circle, with the circle being the odd one out because it is not made up of straight lines. There were also reasoning tests like “man is to hat as dustbin is to a whole list of things that included “lid”. You were meant to choose lid because it goes on top like the hat goes on top of a man. Arriving in Singapore just after my tenth birthday meant that the 11 plus was the very next thing for me to face when I went up to the final year of primary school. My mother had worried about my school abilities whilst we had lived in Cleveleys and had even gone to ask my form teacher about extra tuition and coaching so that I would be able to pass the eleven plus. She was told in no uncertain terms that that would never happen, as service families are just not worth bothering with as they are always moving on. So it came as a welcome surprise to my mother that a lot of effort was put in by service schools to get pupils up to speed and practised for the eleven plus. The pace was quite pushed and we were set exercises to be done under timed conditions. I can remember we would no sooner have finished a set of arithmetic questions than we would be going on to some of the IQ questions. It was really a hothouse environment for coaching scholars to be able to pass the eleven plus. Being a part of the post war baby boom or “part of a statistical bulge” there had always been accommodation problems for every class I had been in with either extra desks needed or an extra classroom having to be conjured up from somewhere. Changi was no exception and when I arrived my class was over in the three-story block across the playground in the Secondary school. For the final year at Primary school a new block was built for us just round the corner from the Anglican Church. Because it was intended to be only temporary it was built of wood and thatched in attap palm leaves. There was a bit of indignation at this but this soon simmered down once we got into the buildings as we found that they were a lot cooler than the brick built buildings of the main part of the school. They also had a spacious and airy feel about them. They also seemed to be a lot quieter and I am sure that this helped to contribute to the air of industry in that final year as we prepared to take the dreaded eleven plus. School was six mornings a week and it was compulsory to attend at least two afternoon activities per week. I looked through the list of options and decided that swimming was a must, as I wanted to improve on my basic achievement of learning to swim in the first two weeks of arriving in Singapore. The second activity I chose was called the “Malaya Club”. Here we learnt about the Federation of Malay states and about some of the trees and plant life. 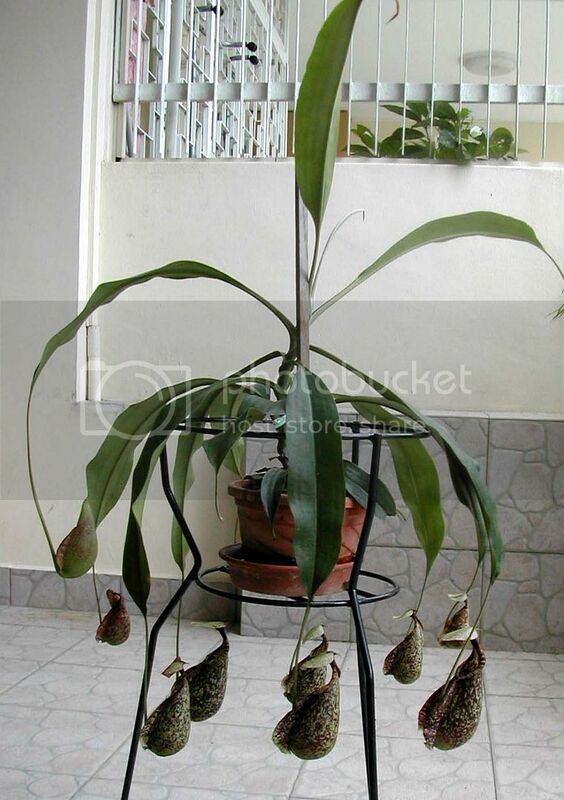 It was during these lessons that I was first introduced to “pitcher” plants in the form of the Raffles Pitcher Plant which I understand if you find any in Singapore now you are not allowed to pick them. Even today I think that they are fascinating plants. During these lessons we were also introduced to the Hibiscus and some of it’s herbal properties. We often used them to make hot poultices; I once had a septic spot on the palm of my hand where I had fallen onto some mimosa and got a thorn stuck. When it turned septic it was straight out and gather up some hibiscus flowers, pour on boiling water then slap the poultice onto the infection to draw it out. It very quickly cleared up with this treatment. I had suggested this treatment to my mother after hearing about it in “Malaya Club”. We were also introduced to number of other trees including the fragrant “Frangipani”. Frangipani are amongst my favourite trees, maybe because I can recognise them easily, but also because of the fragrance which is sweet and heady. My swimming progressed well and I soon reached the stage of taking the beginners certificate which entailed swimming a length of the pool (33 yds) breaststroke and crawl. Then I worked up to the advanced which included 3 lengths of breaststroke, 3 lengths of crawl, a length of backstroke and a dive from the side of the pool followed by a dive from the 10-ft high board (about 3 metres for you metric youngsters). The eleven plus exam was looming, we had moved house by this time, from Lloyd Leas to Wittering Road on the main part of the camp near to Changi Village. I was promised that if I passed the exam, I would get a bicycle as a reward. It was then that we found out that as well as the eleven plus examination, we would also be sitting the Scottish equivalent called the Moray House exam. This was in case any of our parents were posted to Scotland on their return to the UK. The exam days came and went and didn’t seem all that stressful. It was my first experience of being herded into a large hall full of desks with very stern and official looking invigilators, a large clock on the wall to show how much time you had used. Some found it intimidating but we had been coached so well most of our class just sat down and worked through the papers like it was a normal classroom exercise. Once the exam was over I then began to worry as to what would happen if I passed one exam and not the other. Would I still get that bike? I so desperately wanted that bike. It turned out that I need not have worried as I had passed both exams. So I got my first bike. I went down to Changi Village with my dad and we had a look at what was on offer and found one to fit me. It was a German cycle called Heiko. It was of the “sit up and beg” variety as most bikes were in those days with pull up brakes. Learning to ride it is of course another story. Signboard for Bourne Secondary School in Gillman. The motto says "Keep Faith". According to Lynne Copping , The Alexandra Grammar School was renamed Bourne Secondary School in 1964. At this point I should have been moving on to Changi Grammar but my father was posted to RAF Tengah on the other side of the island. 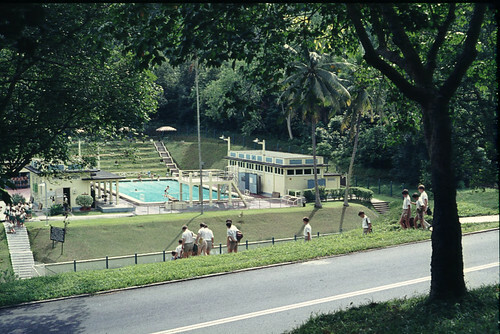 There was only a primary school at Tengah and so we were taken by bus to Alexandra Grammar School at Gillman Barracks close to the city. Each day became a well practised routine, my mother would wake me at about 6:00 each morning and I would get up wash and dress, make up some milk for my breakfast and for my younger brothers who were still asleep. Then breakfast would be a couple of Weet Bix biscuits with milk and some coffee made with Carnation evaporated milk. I can’t stand the taste of it nowadays but when it was all you get, you had to get used to it. I would put Radio Malaya on to listen to the start of the day’s programs which always started with “oh what a beautiful morning, oh what a beautiful day”. At the point where he sings about elephants eyes, the bus would be passing our house up to the top of Meteor Road. At the top the bus would turn round and start picking up. From Meteor Road we would head across the light controlled runway sometimes having to stop for Canberras and Venoms taking off laden with armaments. This was during the time of the “Malayan Emergency” where the communist insurgents were being dealt with. The UK government didn’t want to call it war after having spent so long at war, hence the term “Emergency”. From there we proceed along what is now the Choa Chu Kang Road towards Bukit Panjang and then turn right towards Bukit Timah. Along the way we would pass “Metal Box” and “Ford” factories picking up some more passengers at Foo Yong estate just before we got to Bukit Timah. 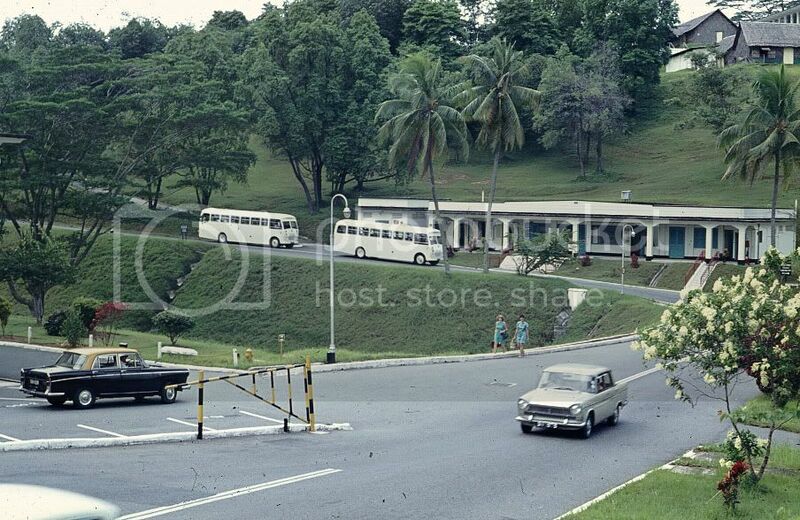 From there we would make a small detour off Bukit Timah Road to pick up an officer’s daughter and then proceed back onto Bukit Timah Road down to Newton Circus and exit onto Scotts Road until we reached Orchard Road. On the corner of Orchard Road, there were always magnificent posters for films at the Shaw Brothers Cinema. The most remarkable was the poster for “The Vikings”. I didn’t get to see this film until some years later when we returned to the UK. From Orchard Road the bus would take us along Tanglin Road and then turn on to Alexandra Road driving past the Archipelago Brewery. Once we had passed the British Military Hospital (BMH) with a distinctive cross of St George painted on the roof, we knew we were almost there. I think the hospital is now known as Alexandra Hospital. Just after the hospital was a bend and then a left turn into Depot Road where we would be dropped off to walk up the hill to Alexandra Grammar School whilst the bus carried on to the Alexandra Modern School. Two of the 3 RAF white buses that Jeff Pittman says served Bourne as school buses in the '60s. Numbered TB1, TB2 and TB3 they where for RAF children, and the designated routes were for Tengah based families. Most days the journey would be uneventful, there was a sing song along the way with all the Scout favourites like “You’ll never go to heaven” (On an RAF bus, cos an RAF bus, wont take all of us.). Popular songs of the day like The Everly Brothers’ “Wake Up Little Suzie”, and Elvis Presley’s “Teddy Bear” and “Wont You Wear My Ring Around Your Neck” were also firm favourites. In 1959 there had been a long period without rain and the day that the Prime Minister, Lee Kuan Yew announced that if it didn’t rain soon, drought measures would have to be put in place. Well, of course it started to rain early that morning and it just kept on raining heavily. On the way back home the bus was brought to a standstill by the floodwaters near the biscuit factory. We were stuck there for a long time. Eventually the waters subsided enough for the bus to get through. When we got to Bukit Timah Road the canal that runs between Bukit Timah Road and Dunearn had overflown it’s banks and those people that lived in tents alongside the banks were trying to dry out their few meagre belongings. At AGS I was introduced to science. As well as the General Science lessons we also had some lessons called Applied Science. I find it hard to put into words the thrill I found in science. The general science looked at some chemical reactions and the differences between mixtures and compounds. There was also some physics in there looking at the expansion of metals when heated. The applied science covered topics like electromagnetism and how bells and solenoids worked, transformers, microphones and telephones how batteries worked. There was even a visit to the telephone exchange where we could see all these applications at work. This was a subject that I could get wrapped up in and at the Christmas exam time I managed a score of 98%. This was indeed the start of a passionate and lifelong interest in science and the application of science. At the start of the autumn term we were more or less assigned to forms in date order of our applications. Because of the move from Changi to Tengah I was down at the bottom of the list and ended up in form 1F. The Christmas exams were used to grade us and I moved up to class 1B. Despite having a wonderful memory for all sorts of things I cannot recall the names of any of the people in form 1B. However, from form 1F, I do remember a Graham Miller but that is probably because I met him a few years later in the UK on a canoeing course. Sport was never my forte. I hated gymnastics and even smacked my head trying to do a handspring. I guess I was just basically clumsy. 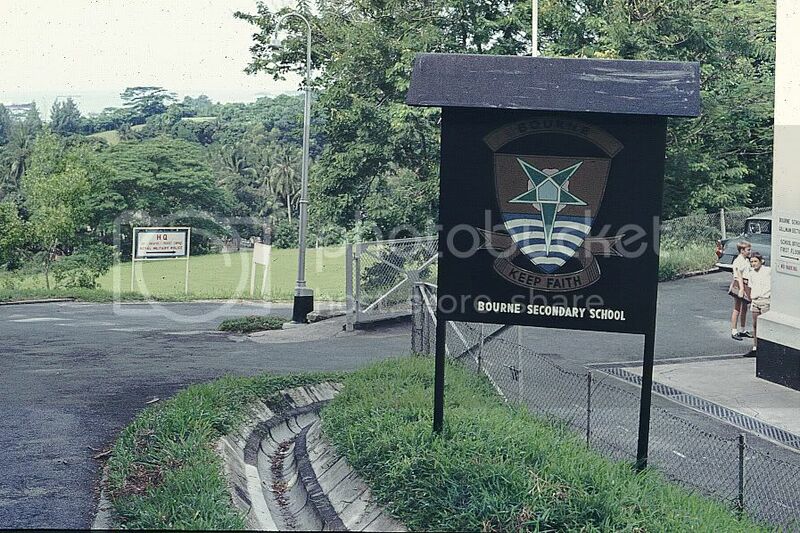 I also hated running though the cross country runs we used to do took us on a route out the back of the school and onto the hilltop and around a small Kampong before heading back to school. The runs were only short as we didn’t have much time and the heat made it hard work. Swimming was a completely different matter and we always had a least one lesson a week at the swimming pool. In water I guess I was like the ugly duckling transformed into a swan. I was very fast at breast stroke and was picked to train for the school team. I attended the first weeks training but there was no RAF transport back to Tengah. There were three of us from Tengah and we managed to persuade the bus from the Naval Base to take us and drop us off in Bukit Panjang. From there we walked a little way over the level crossing and maybe walked for about fifteen minutes before somebody stopped and gave us a lift. When I got home my mother hit the roof and put her foot down saying that if there was no transport back to Tengah then I was not going to be attending the training sessions. So that finished my promising start as a competitive swimmer. Well, that meant I could enjoy swimming without having to put in all that rigorous training. AGS was where I first experienced learning a foreign language formally for the first time. In the first year we were introduced to French. I found it fascinating though I was never good at French I was probably in that band of scholars that hovers around the middle, neither doing well but not doing badly. One of the French teachers was a Madame Hook and I am sure that she used to wear a cape to school and seemed a very strange woman. Maybe I dreamed up that bit about the cape, I’ll have to check with my friend Raymond Clayton to confirm that. Form 1B had the disadvantage of having a distracting view out to the approaches to the harbour. I do remember being distracted sometimes by the large ships passing by particularly if the lessons were getting a bit heavy. At the end of the summer term we were scheduled to return to the UK just as the term finished. We were supposed to be returning on the SS Nevassa a slightly newer ship than the Dilwara that we come out to Singapore on. I recall seeing the ship coming into harbour and thinking I’ll be on that the day after tomorrow. Unfortunately, it was not to be. My father came down with a bad bout of influenza and was quickly followed by my two brothers. This meant our leaving was delayed and we ended up flying home from Paya Lebar airport on a Hunting Clan Britannia turbo Jet. This was another first for me flying in an aeroplane. It was so memorable for me that I can remember the registration of the aircraft as G-APNB. The other thing that is memorable is that this was the last aircraft that my father ever flew in and it was duly noted down in his flying log which he had kept up to date since ferrying aircraft across the Atlantic during World War II. Good Morning Yesterday is a blog on life in Singapore during the late fifties and early sixties with contributions edited by Lam Chun See.